Share your experiences with Bullet 350? Royal Enfield’s retro design ethos has worked well for them and the Bullet 350 is as authentic as it gets. The Bullet 350 gets the Royal Enfield signature tank, stepped seat, spoked 19-inch wheels and chrome battery box. There is generous use of chrome in the exhaust, mudguards and headlamp bezel. 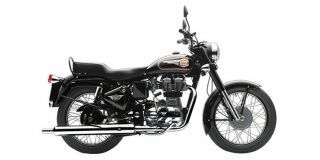 Confused about Royal Enfield Bullet 350?